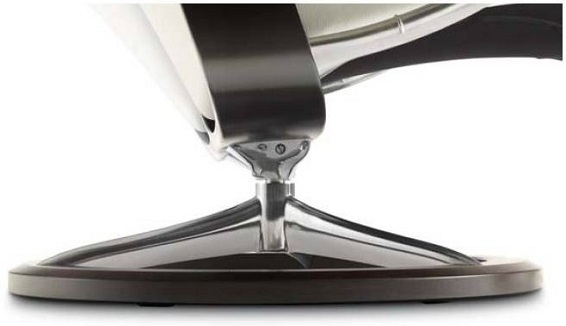 Stressless Signature Base Consul Recliner and Ottoman- Enjoy the highest levels of comfort. Enjoy Fast, Worry-free Delivery on a Stressless Signature Consul Recliner with Ottoman. 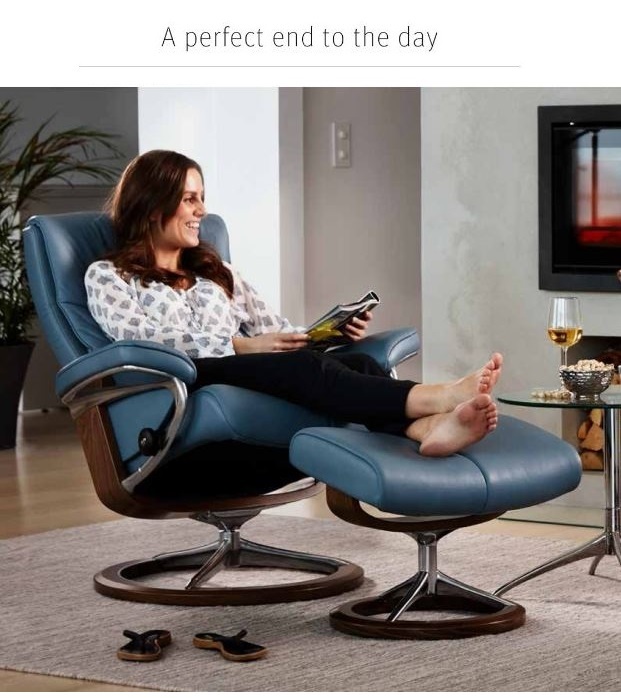 It's a great time of year to purchase from the amazingly comfortable, Stressless Consul line! This popular, modern recliner delivers exquisite head, neck and back support and the over-stuffed smooth, soft, cushioning allows you to sit undeterred for many hours on end. The Stressless Consul Signature recliner is among the most modern Stressless recliners available. The New Signatures Series Base Collection by Ekornes is guaranteed to impress. The BalanceAdapt Technology allows for increased function and enhanced comfort. Think you know Stressless? Think again. The new Signature Bases have a slight Rocking Feature, a deeper recline, and allow you to lay out in a completely flat, 180 degree, position when in Sleep Mode. Call or Chat with an Ekornes Brand Specialist now to learn more. Click here if you want to view the traditional Stressless Consul Medium Recliner and Ottoman with the familiar wooden hourglass base. You can truly relax and unwind when you choose the world's most advanced recliners. From the patented technologies, to the outstanding construction and engineering, down to the incredibly useful accessories, you will be able to relieve stress and tension and promote a genuine sense of well-being in this seating solution. The Designers at Ekornes in Norway know that while Leather has a large crowd-following, there will always be a large demand for an extensive Fabric Upholstery Selection. Click here to view our Stressless Fabric Informational Page. The wide variety of fabrics gives you a wide-specturm of textures, colors, appearances, and more to consider when selecting a beautiful Fabric Covering for your New Stressless Signature Series Recliner and Ottoman. New Calido Fabric has already gained popularity amongst the various fabric offerings. There are 10 different, beautiful color choices in Calido Grade Fabric. They range from the hearty Pomerol to the Light Beige and Lighter Green variety. It is an Italian Milled Wool Felt material and meets a robust 80,000 Martindale Cycles Rating in abrasion resistance testing. Ekornes is also introducing a new Full-Grain Leather called Noblesse. This is the absolute, most-exclusive leather grade offered by the manufacturer. It is through dyed so it will retain it's color for decades to come. During the tanning process, only the faintest touch of protective lacquer is applied to the leather's surface. This allows the natural softness and luster to glow without hindrance. Some might even say that Noblesse is softer than the former Royalin Grade Leather. The natural grain and texture have been retained the tanners do not correct the surface of the leather. This means that minor color nuances and skin blemishes may occur. This grade is the most delicate and therefore vulnerable to UV exposure and spills/stains. 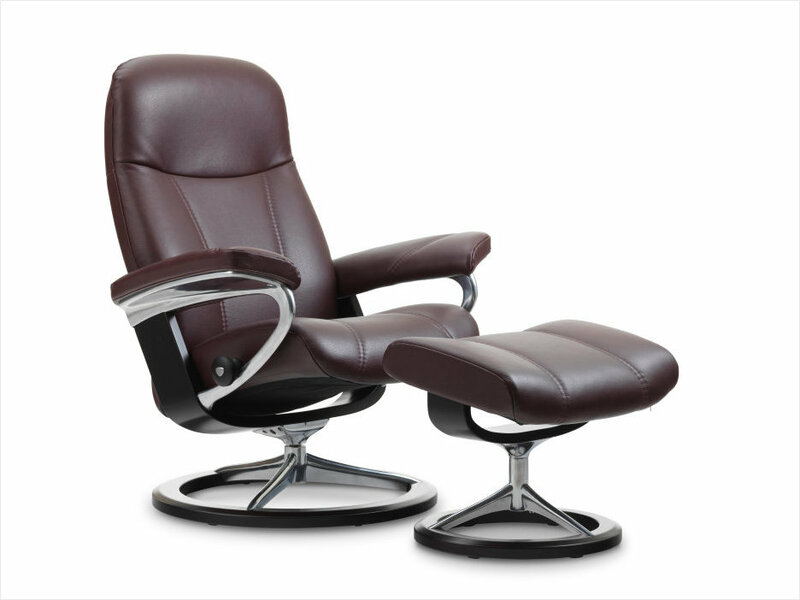 Choose your Stressless Consul Recliner with Signature Series Base and get Noblesse leather to top it off. The Stressless Consul Recliners match the Wave Series Sofas perfectly. They accent nicely with the Arion Sectional Options as well. When the Atlantic and Pacific Recliners by Ekornes were discontinued last year, the Consul was introduced to match the sofas that remained. Check out our selection of Stressless Wave and Arion Sofas to find your matching furniture set. Stressless Recliners by Ekornes of Norway are the only furniture line to be endorsed by the American Chiropractic Association. This is the largest Chiropractic Association in America. It is based in Virginia and serves as the national voice for the profession. The official announcement was made in 2002, but we wanted to remind you that when you choose a brand-new Stressless Signature Consul Recliner, you are not only choosing style. You are choosing a back-healthy seating system. Being healthy is a priority. No longer can we afford to put our back health and overall well-being to the side. Choose a Chiropractor Approved, Back-Healthy Recliner from Ekornes and you are choosing to make your healthy a priority. You are putting an end to back pain and discomfort. You are investing in a more comfortable tomorrow; a more comfortable version of yourself. Plus System- allows the head rest of your new Ekornes Consul Signature Series Recliner to come forwards slightly as you recline in your seat. This allows you to easily carry on conversation, maintain eye contact with the television or enjoy a snack. Lumbar Support- the adaptive ability of the lumbar support allows it to change shape as you recline to ensure you receive the proper amount of support at each changing angle. 360° Swivel Base- the patented 2 stem base and 360° range of rotation allow you to effortlessly reach items all around you with minimal strain. Glide System- the seamless glide wheel system allows you to recline or sit upright in your chair with a simple adjustment of your body weight. There are no levers to jerk or buttons to push.